In this tutorial you will learn how to make your first JSP page? In this tutorial you will learn how to create your first page and then run on the Tomcat Server. Tomcat server is one of the most popular Servlet Container for deploying and running the Java based application. In this tutorial you will learn how to make your web application and run on Tomcat Server. How to create First JSP Page? In the first tutorial we will use the JSP expression for adding the Java code. Create the above file and save as "index.jsp" file. Next step is to create the web application and then deploy on the Tomcat Server. 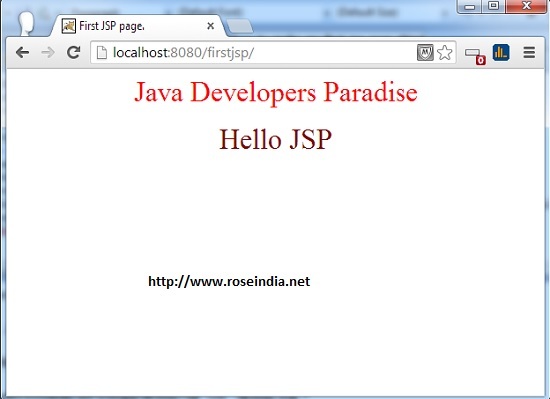 Above example code display the "Java Developers Paradise" and "Hello JSP" on the browser. You can click on the following URL to run the example online on our server. To deploy and run the JSP application we need the Tomcat server. If you don't know how to download and install Tomcat please check the tutorial "How to install and Configure the Tomcat Server?". Go to any directory of your hard disk and then create a directory "firstjsp", in my computer we are using the "D:\examples\roseindia.net\webapp\firstjsp" directory. You should save the "index.jsp" file into the root of the web application as shown above. Now to deploy the application copy the firstjsp.war into the webapps directory of the Tomcat and then start the Tomcat. Download the Source code and the war file of the application discussed here. Check more tutorials of JSP at our JSP Tutorials Home Page.